The state of Alaska is going to war against an invasive species in Sitka, and its weapon is science. 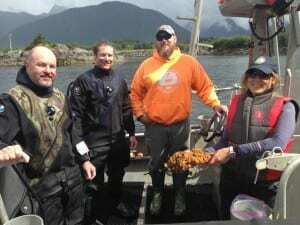 Earlier this summer, the state Department of Fish & Game and the Smithsonian Environmental Research Center developed a concept for fighting an invasive sea squirt in Sitka’s Whiting Harbor. This month, they’ve deployed dive teams for a full-scale test. Their objective? To kill off this organism before it affects any other Alaskan waters. Whiting Harbor is not a big patch of water — but it’s big enough for D.vex, or Didemnum vexillum, to have gotten a toehold in Alaska. And it’s not letting go. 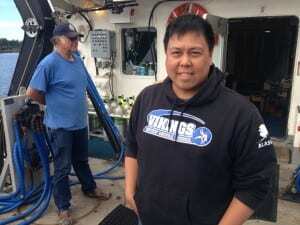 D.vex likely hitched a ride to Sitka over a decade ago on equipment for an oyster farm. That oyster farm is long gone, but Dvex has spread to the sea floor, and there’s nothing really to stop it except Tammy Davis. 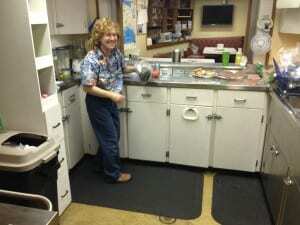 Davis, on VHF radio – Okay… we’ll spike this chlorine, take a sample, then come find him. 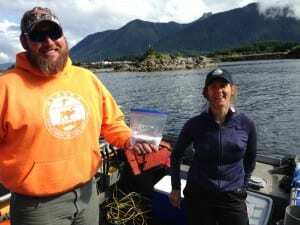 Davis is a sportfish biologist with the Alaska Department of Fish & Game who’s leading the effort to eradicate D.vex. 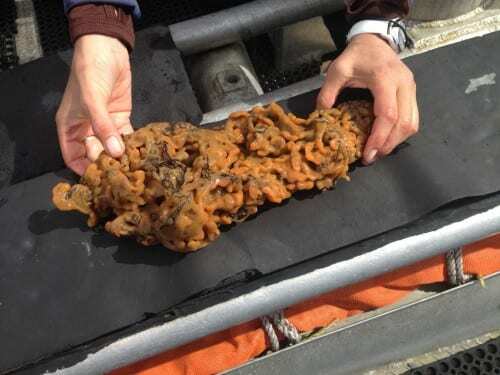 The invasive sea squirt has blanketed the seafloor in once-productive fishing grounds on the US Eastern Seaboard, creating underwater deserts. That’s exactly what Davis doesn’t want to see happen in Alaska. She takes me aboard her dive skiff, one of three working test plots in Whiting Harbor. This boat is piloted by Cody Jacobson, a sportfish biologist from Palmer. 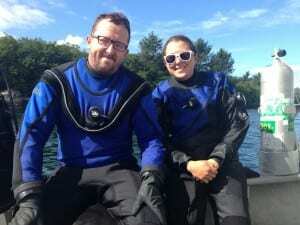 The divers are Scott Forbes, a commercial fisheries biologist from Juneau, and Jeff Meucci, a dive safety officer with Fish & Wildlife. In the next boat are two more Comfish divers, and a representative from the Bureau of Land Management, which owns the tidelands in Whiting Harbor. The third skiff is manned by two scientists from the Smithsonian Environmental Research Center. Anchored about a quarter-mile away, outside of the infested area, is the 105-foot state-owned research vessel Kestrel, with three crew members. For a state that’s having trouble making ends meet, a lot of money is going into stopping D.vex. Davis says it’s a deliberate choice. “In terms of invasive species, aquatic or terrestrial, do you spend money today to prevent spending a lot more money later to deal with a larger problem?” she asks. Because several agencies are involved, Davis doesn’t have an exact number. Somewhere in the six-figure range, certainly. 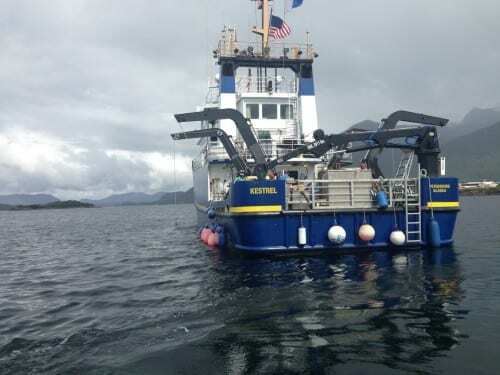 D.vex eradication was funded in last year’s state budget for capital projects, with the advocacy of Sitka’s municipal government and both state legislators. There is a lot riding on stopping it here in Sitka. We pull alongside the Smithsonian skiff, and I go aboard to talk with Ian Davidson. “There are things here in the bay that eat it. They just don’t control it,” he says. Things like leather sea stars. Ian Davidson is originally from the south coast of Ireland. He now works for the Smithsonian in Maryland. He designed this assault on D.vex. It’s chemical warfare. The dive teams are placing fabric domes about 8 feet square on the bottom, and then pouring in either large amounts of salt, chlorine, or lime dust. The treatments should kill the D.vex, according to Davidson and his colleague Michelle Maraffini, and possibly most everything else under the dome. 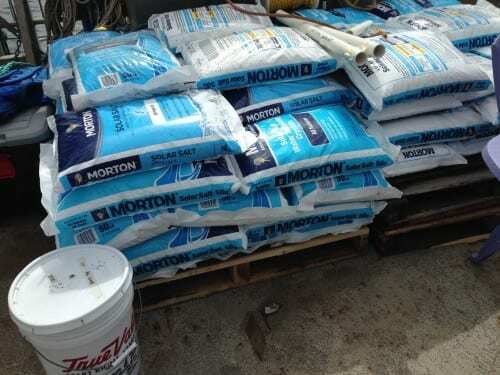 “If you want to get rid of this problem, then there’ll be a temporary hit to non-target species in Whiting. But all of the local species will recolonize. So this whole area will go back to the way it was without Dvex in it,” said Davidson. Maraffini lives in California, where there are hundreds of documented invasions of various species on land, in freshwater, and in the ocean. D.vex is there. It’s also been found in Oregon and Washington. The next-closest site to Sitka is about 600 miles away, in British Columbia. This distance is the key to beating D.vex in Alaska. “Usually we catch an invasion too late. It’s already spread farther than we can control. This one is isolated. It’s pretty far from the next population. This is our best chance of success at an eradication experiment,” Marafini says. The experiment exposes D.vex to high concentrations of salt, chlorine, or lime for about four hours. The divers will then pull up the domes and, three weeks later, Davidson and Maraffini will return to see what agent was most effective in killing D.vex. Once they have an answer, they’ll design a bay-wide attack. Tammy Davis has asked her divers — and I’m sorry to use this expression — to bring some up for me. D.vex is often mistaken for a native sponge. But it looks dangerous on the deck of the boat — it feels like a lab tech has pulled a vial of measles virus out of storage. The divers joke that I could take it home and put it in my aquarium. I would do it, if I knew that I could kill D.vex just by pouring in some salt. We won’t know if this trick works, though, for another three weeks. Davis – We’ll keep in touch.